I often hear that the biggest challenge to cloud adoption is the talent gap. Based on my own experience and research conducted with successful partners, I’ve found that hiring and training top talent is essential to long-term profitability and sustained growth for any cloud business. 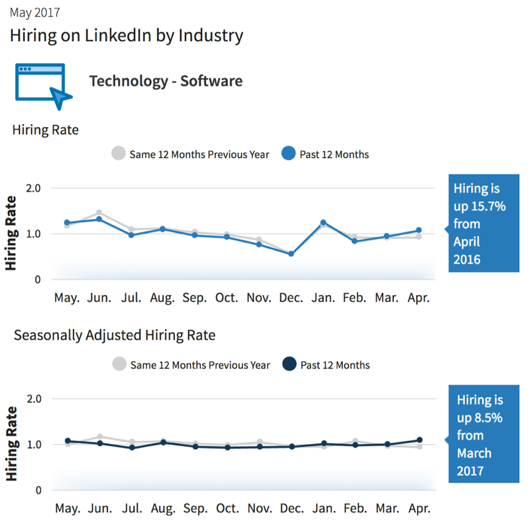 Interestingly, while partners continue to struggle with finding the right talent, hiring is on the rise (as illustrated in the LinkedIn Workforce Report released earlier this month). In fact, April 2017 was the strongest month for hiring since June 2015, up 16.7% from last April. But the question is, how do you tap into these current hiring trends? Similarly, how do you train your employees so they’re up to speed with the latest cloud technologies? Use these three steps to make sure you’re hiring and training the right people along your cloud journey. If you’re starting a new practice, you’ll want to evaluate your existing team members (if any), and decide whether to hire new employees or bring existing employees up to speed. To help you decide, make a plan that describes your resource gaps and the requirements of the resources you would use to fill those gaps. If you decide to hire new employees, social channels like LinkedIn continue to be useful tools for recruiting top talent. Through the Microsoft Cloud Practice Development Study, we found that referrals and LinkedIn rank among the top source of candidates. Tip 1: Proactively post job descriptions through online recruiting tools. Tip 2: Leverage your network to find others that are actively seeking new job opportunities or have references that are searching. Tip 3: Recruit talent within your organization and help them grow their capabilities by learning new skills to accelerate their career growth. Diversifying your business focus is critical to driving long-term success, as it creates a unique value offering for your customer base. To do so, it often requires hiring specialists in your business that have industry knowledge and relevance to the target customer base you are looking to serve. For example, if you were assessing your customer base with a medical focus, consider hiring a nurse, doctor, or medical specialist. By hiring a team of both subject matter experts in technology and people with backgrounds in the market you’re serving, you’ll be better prepared to deliver more relevant cloud solutions. Based on our research, hiring the following technical, marketing, support, and management roles can help you grow your business in today’s cloud world. Even the best products need a sales strategy to gain maximum market traction. Depending on the size of your company, consider hiring for sales positions that have a broad reach. This could include a sales solution manager, cloud infrastructure solutions sales manager, or technical sales manager. Marketing is a key function for a successful cloud practice and partners that invest in marketing resources tend to be more successful than those who don’t. Consider hiring a product marketing manager that can help execute on key campaigns and customer outreach as well as build the brand and messaging to go along with it. Technical roles are the heart of your Azure solution and practice. Hiring the right people can help turn your vision into a reality. Roles like cloud architect, data architect, data scientist, big data engineer, senior software developer, and software developer are important to consider when building your team. If your cloud development practice will involve eight or more technical staff, consider hiring for management positions like a product manager or program manager. In smaller teams, senior-level employees often take on management duties along with their other responsibilities. A lot of effort goes on behind the scenes, specifically in positions that involve post-sales customer engagement. To ensure long-term success, consider hiring for roles like a customer success manager, quality assurance (QA)/test technician, information security analyst, and user support specialist. For a detailed list of cloud practice job descriptions, check out the Cloud Practice Development Playbooks. An understanding of their roles and of any changes to their current position. Time and resources to explore the technologies. An understanding of the business case for the technologies. Microsoft’s Azure Skills Training catalog helps people enrich their technical skills with deep, hands-on, Azure online training. Available in multiple languages, these free online courses cover a range of Azure-related topics through in-depth courseware, videos, labs, and assessments. You can also encourage employees to enroll in various training programs, join Azure user groups, and participate in brown bag knowledge sharing sessions amongst their peers. Hiring technical talent in the cloud market can be challenging. Consider hiring talent based on technical competency and a willingness to adapt and learn cloud technologies, rather than hiring based on cloud experience alone. What hiring and training practices have you found to be most successful in building and growing your cloud business? Share your thoughts in the comments below.